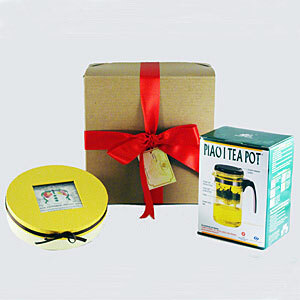 This gift pack is for the special someone who wants to get his/her mouth more than a little wet with Pu-erh tea. It has everything that is needed to brew tea at home or at the office: A 200g Bana Limited Edition tea cake that is made from 100% grade-one premium tea that was picked from the 2008 first Spring harvest; and a 500cc Piao-I teapot with its patented controlled-infusion chamber. Pu-erh tea can brewed again and again (up to 12 times) and with the Piao-I teapot, re-brewing the tea is a snap. A great combination!